About 40 members alighted from the Sarah Siddons tour at Neasden and were directed along the official walking route from the station to the Control Room Building by Nick Agnew, Standard Review Manager, London Underground and President of The Locomotive and Carriage Institution. In area set aside for training on retail systems, surrounded by various ticket barriers and different generations and types of ticket issuing equipment including ticket office machines (TOMs) and Passenger Operated Machines (POMs), we were given an introduction to the Jubilee Line by Nick Agnew and Pat Henby who is the Service Control Manager for the Jubilee Line. The concept of building much of the Jubilee line route to relive congestion in parts of London, which lacked decent public transport links, goes back until before World War II. Due to the lack of an extensive network of Underground lines in South London, compared with North London, a Bakerloo line extension to Camberwell was planned during the 1930’s, but stopped due to the War. The original new section of the line from Baker Street to Charing Cross was originally going to be called the Fleet Line after the Fleet river, but was renamed the Jubilee line after the Queen’s Silver Jubilee in 1977. Even now some long-serving Underground staff still refer to the “Fleet Line”! The original Jubilee Line, which opened in the 1979, consisted of 2 miles of new tunnel from Baker Street to Charring Cross and a ‘take-over’ of the Stanmore branch of the Bakerloo Line north of Baker Street. To expand the Jubilee Line further it was essential that the route was safeguarded which, in particular, placed restrictions on the deep foundations of skyscrapers so that a path was left for the route of the line. Construction of the Jubilee Line extension was started in December 1993 after receiving Royal Assent in March 1992 and consists of 10 miles of totally new line from just south of Green Park to Stratford in East London. A total of 7.7miles of the new line is in tunnel and the extension tunnels under the Thames in four places. En-route to Stratford the extension serves parts of South London previously deficient on good transport links, the massive Docklands office development, the Dome (for a year!) and the comprehensive transport interchange at Stratford. The Jubilee Line is the only Underground line to connect with all other Underground lines. A short section of the original Jubilee Line from Green Park to Charring Cross was closed for passenger traffic due to the extension. The total cost of the extension was approximately 3.5 billion at the end of the project. The extended Jubilee Line introduced ‘think-big’ type of thinking to the construction of underground railways and this is in particularly obvious in the construction of the stations on the extension which are very different from previous Underground stations. The Jubilee Line Extension project management team, lead by the project architect Roland Paoletti CBE, were keen that some up-and-coming, but relatively unknown, young architects would have the chance to design some of the stations, as well as the more widely known ‘big names’. A number of the stations on the extension have been designed to provide exceptionally good bus-Underground and Underground-heavy rail interchange and this policy forms examples of best-practice to be followed by Transport for London (TfL) in the design of interchanges in the future with other operators such as bus, National Rail and river operations which TfL has control. The construction of two of the stations, Bermondsey and Southwick, was authorised late due to concern about the financial case, but eventually did go ahead and both serve local communities, which previously only had bus links. The construction of the Jubilee Line Extension was a huge project and certainly had its problems concerning cost and time over-runs. Westminster Station was an exceptional engineering challenge due to the need to both add the Jubilee Line platforms and drop the existing District and Circle line platforms by 6” to allow for the construction of Portcullis House, the new MPs building, above. During construction Westminster station was the country’s deepest and most complex excavation. A very major rebuild took place at Stratford which, even before the construction of the Jubilee Line extension, was a major transport interchange between the ‘heavy rail’ lines from Liverpool Street to Essex, The North London Line, Central Line and bus, all presented in a terrible and difficult to use railway station and a dingy and uninviting bus station which had a multi-storey car park above. The new interchange offers a dramatic improvement and is regarded a showpiece transport interchange for the whole of the UK. The Channel Tunnel rail link will also interchange at Stratford in the future. The main maintenance depot for the Jubilee Line is Stratford Market Depot and is one of the best facilities on the Underground for the storage and maintenance of stock. Design of the depot benefited from being on a ‘green-field’ site and has won architectural awards despite being a practical building. A number of the tracks within the depot are mounted on pillars rather than at ground level so as to much improve access to the underframe of the trains for maintenance. Both the depot and the stations on the extension have been designed for traffic growth. The whole Jubilee Line extension won the Millennium building of the Year award by the Royal Fine Arts Commission Trust with special commendation for Westminster, Southwick, Canary Wharf and North Greenwich Stations. The Railway Industry Innovation Award was awarded for the whole extension in 2000. The Civic Trust’s Urban Design Award was awarded to London Transport for the extension and finally, Stratford and North Greenwich stations were awarded a Royal Institute of Architects (RBIA) Civic and Community Award. Construction of the Control Room building, which was specifically built for the extended Jubilee Line, started in 1996. Operation of the line has it problems, but when everything works, it can be exceptionally good; but due to its complexity, when equipment falls-over the results can be disastrous. The line is virtually two different railways with the extension south and east of Green Park to Stratford employing quite different systems and requiring different operational procedures to the original line North and West from Green Park to Stanmore, which has not been updated. Running two railways as one makes the line a challenge to operate. The Alcatel overlay control and signalling system works well, but again has many problems and only achieves 60% of its desired reliability. Many of the failures are due to systems integration, with so many new and innovative systems employed on the extension it was too difficult to get everything right for the opening of the line, but problems are now being resolved. One particular problem with the extension is that the track layout was designed for Automatic Train Operation (ATO), which has not yet been implemented. With ATO ‘driving’ of the train is undertaken automatically with, in normal operation, the train operator just being responsible for door operation, starting the train from each station stop and vigilance. The Victoria Line first introduced ATO to London Underground. In the case of the Jubilee Line extension, not operating in ATO adds a number of restrictions to take into account of possible driver misjudgements on manually driven trains. For example, at North Greenwich, the junction points are located very close to the end of the platform with less than the usual overlap past the platform starting signal. Without ATO through running approaching trains have to be held outside the station if a train movement is planned at the other end of the platform. There then followed a short question and answer session. The problem of people vaulting over ticket gates was raised. It was reported that this is a difficult problem to get right as floor to ceiling gates, as in New York and Paris would reduce visibility on station concourses and make the system much more imposing and off-putting which is likely to deter some customers from travelling. So instead the policy is to staff each barrier line and have extensive CCTV coverage. Amazingly, it has often been found that those vaulting the gates, when challenged, have valid tickets anyway! Brian Bary, Duty line Control Manager, guided us around the Control Room. The most dominating feature of this large room is a large ‘video-wall’ on the rear wall which displays the whole of the Jubilee Line including East of Green Park and the Charring Cross branch. In front of the video wall are eight workstations, which were exactly the same as those in the simulator – see below. When the operator logs on the workstation is automatically configured to the profile of the operator – such as a controller of signalling, power, ventilation etc., though some of these functions are still under development. The system was developed and installed by Alcatel. Currently the Control Room only operates the signalling from Stratford to Green Park, with the remaining ‘legacy’ railway East of Green Park controlled by Baker Street Control. It had been intended that the remaining section of the line would be integrated into the control room in 2003/2004, but this process is currently on hold due to the PPP process. At 03.00 each morning the timetable for the following days operation is loaded. If everything goes to plan the system can then automatically signal and regulate the trains from the timetable. However, inevitably problems occur during the day and so the signalman’s job is to ‘step-in’ to make ad-hoc changes, as required, to the timetable and train regulation. At the start of each day’s operation each train set is assigned a three-digit train number (which can usually be viewed on the front of the train from the outside), as it leaves the depot. Each train number has a number of trip numbers assigned to it, each trip being an end-to-end ‘diagram’ which details the start and finish points and timings. An operator can click on a train displayed on their workstation and view all trips assigned to it and then modify those trips, such as to recover the timetable quickly after incidents. A typical modification would be to cut a trip back and thus turn a train round short of it’s scheduled destination so as to regain right-time working. As well as being able to modify trips during actual running, these can be modified in advance, if required. Of course, drivers’ rosters must also be carefully considered when making service alterations and these can also be displayed. Drivers work between 4 and 9 hours per day, and each shift could consist of multiple trips or just one round trip. Flexible rostering is employed, which has many pros-and–cons, but does limit the number of spare drivers available to recover from an incident. Night men cover last and first passenger trains and in between those turns are available for depot stock movements during the night. Alarms, such as for train radio mayday messages and signals past at danger are displayed on one part of a screen on each workstation. All alarms are currently displayed in the same manor but a future software upgrade will colour-code them depending on severity. All alarms are automatically recorded in an event log. Station CCTV is also monitored and recorded in the Control Room. Cameras, including in the lifts, monitor virtually every area of the extended Jubilee Line stations. Some stations are equipped with over a hundred cameras. Use of passenger help points automatically triggers a view of the passenger on the operator’s screen, which is recorded. Jubilee line tunnel and ventilation control is also within the same room. The tunnel and ventilation user interface allows each ventilation fan on the system to be viewed and individually configured. During an incident requiring revised control of the ventilation system, (to clear smoke or reduce temperature, for example), the actual scenario is looked up and then a reference number keyed in which then configures the fans accordingly. Fortunately, this feature has not yet been tested in anger! Additionally, at each station the temperature is constantly monitored and the fans automatically configured to keep the temperature within closely-controlled limits. In one corner of the corner of the control a back-up control system made by Westinghouse is installed, which is utilised when the Alcatel system fails. This simpler system allows continued operation of the Jubilee Line, albeit with less functionality, as it does not display train numbers on the operators’ displays. Whilst regularly used initially, fortunately this system is now less frequently used. 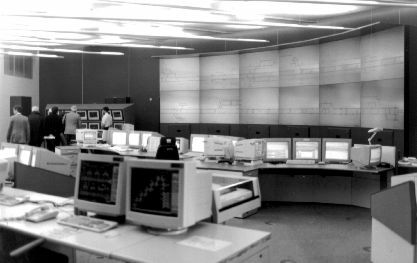 The Westinghouse control system consists of a stack of twelve monitors or ‘panels’, which display the track layout and train movements throughout the whole line. Each panel is also installed locally at selected stations and these can operate the line in emergency. Whilst we visited the Signalling Training and Developing Suite before the Control Room, I have placed this section afterwards so as to more logically explain the function of this area without having to repeat concepts discussed under above. The Signalling Training and Development Suit consists of only two workstations without live connection to the operational railway. Apart from not being connected to the ‘real-world’, the workstations are virtually identical to those used in the main operational Control Room. All new versions of control software are tested on the simulator before being introduced into the Control Room. So as to provide continuity, the same known ‘good’ timetable is always used to test each software upgrade. At the time of our visit, eight more software upgrades were planned for 2001, each progressively improving information available to the operator and functionality. It is planned that future software builds will add improved automatic junction routing control for out-of-turn running, so easing the work undertaken by the operator. New timetables are always tested on the simulator in advance of issue so as to check both for correctness and any operational conflicts. As well as general new line timetables updates, ad-hoc special event schedules, such as over the Christmas period, are also tested. There was obviously much apprehension amongst staff regarding PPP, which will result in a major change in culture – INVICOS (infrastructure companies) will be contracted to deliver against operators requirements for number of trains run per hour and can, to an extent, decide what equipment and resource are required to deliver. Finally, we did not conclude our tour until after seven o’clock on the Saturday evening. The professionalism, enthusiasm and openness of all the London Underground staff on that Saturday was most noticeable and I would like to thank all those involved at LUL, on behalf all those who took part from the Locomotive & Carriage Institution for a most enjoyable and interesting day.